Check out various events going on in the DFW area for you get social, connect with others, and grow professionally and personally. With Launch's new rebrand, we are now hosting our startup happy hours on a quarterly basis! Join us and our Q2 event partner WeWorkLabs Thursday, April 18th at WeWork Thanksgiving Tower from 5:30-7:30p. Come out for booze, bites, music, and more while mingling with your local business/startup community. Grab discounted tix & deets on speaking at the next Ignite DFW while you’re there too. Happy Hour is free but RSVP is required. Join the Shops of Deep Ellum for a glorious evening of Rosé sipping, awesome shopping, and amazing good times with friends at the event voted "Best Evening Stroll" by the Dallas Observer. Reserve your glass now by MakeShift Photography, located here in Deep Ellum, and stay tuned for a sneak peek! Follow @discoverdeepellum on facebook and instagram for more details! Dallas Influencer Awards is the first of it's kind the to honor and support social media influencers that are making a difference in social media . Calling all DFW founders (and anyone who's recently been bitten by the entrepreneurial bug)! Join HER TEXAS on April 19th 11am-1pm for our next meetup at Serendipity Labs in the Arts District. The Boss Babes Brunch Tour is the premier networking and empowerment event for women in business who are looking to Boss Up and take their brands to the next level. This event is for women of all backgrounds and levels. Not only are their incredible networking opportunities, there will be workshops led by industry leaders as well as a panel of entrepreneurs and business leaders. It's time to celebrate two of the things we love most: food and drinks. April marks the return of the annual CultureMap Tastemaker Awards, honoring the top restaurant and bar talent in Dallas. Throughout February and March, we'll be profiling the Tastemaker Awards nominees. Then on April 25th, we'll unveil the winners at a swanky tasting event with an awards ceremony. Party with a purpose celebrating Project Xcellence five years of service to the youth of the community. Come kick it for a cause; helping future generations end childhood bullying one-step at a time. All proceeds will be donated to support and aid the youth of a local non-profit organization. All black owned food business and product vendors for natural hair care and beauty products. We will have huge performers, an entire marching band, soulful r&b groups, and enough food for the entire family (barbecue, Mexican, Ethiopian, and much more). Basically, Dallas' first black music festival. For the people, honey. Jar with Most Chips Crowned BEST Margarita in Dallas! Winner gets $1000 & Bragging Rights! Black Menswear and The Baddie Brunch are joining forces to bring you the ultimate experience, THE SOUTHERN CLASSIC, powered by Courvoisier and Effen Vodka. Saturday, May 18 from 1:00pm – 4:00pm at Lofty Spaces. Bourbon & Brownies. Enjoy a selection of our from scratch brownies and blondies paired with two professionally crafted bourbon based cocktails by @PotentPours! All while listening to the smooth sounds of @_The_Abyss. Ticket sales will close on April 11th and space is limited. Live XXV Entertainment and Tha CULT Studios cordially invites you to join us as we acknowledge and celebrate creatives, trailblazers and entrepreneurs around the country who have showcased their many talents at our events. Enjoy slices of pizza from multiple restaurants and food trucks, live music, beer & wine garden & more. There will also be a pizza eating competition. Puppy Treats and Sweets! at Dallas Farmers Market. Featuring and benefiting ‘Take Me Home Pet Rescue’. Another happy-vibes event energized by ‘It’s For Charity! Events’. Workouts are always sweeter with a buddy. And, with 4-legged buddies with names like Lolly Labradoodle, Foxy Frosty, Larry Licorice and German Chocolate Gary, what could be sweeter?! Arts N Beats presented by Corona Premier is an immersive and interactive red carpet experience during Dallas Arts Month, created exclusively to celebrate all forms of arts, music and self-expression while contributing to the Pursuit of Hope. Join in on the fun at the Dallas Arts District Block Party at the ARTISAN! The ARTISAN will offer live music, chef-prepared meals, delicious tapas, handcrafted cocktails and incredible views of the party below on the Terrace! Part 2 of Toast For Charity’s day of care fundraiser brings back their annual brunch event. The goal is to create synergy amongst millennials, cultivate meaningful relationships, and bring awareness to the homeless crisis in the city of Dallas. Enjoy an amazing array of culinary treats from more than 25 of the best food trucks and carts in the Metroplex. This daylong, family-friendly event will feature contests and activities, giant games on the lawn and great live music. Are you an entrepreneur, creative, or influencer? Do you host events and would love to partner with brands to add value to your consumers experience? If you answered yes to any of the above questions then you’re in the right place. Obtaining brand partnerships and sponsorships could be difficult, there’s an art and science to the process. We at COSIGN are here to provide you with the necessary tools to help guide you in the process of landing your next sponsor. Calling all Black Girls Who Paint in the Dallas- Fort Worth Area! The first BGWP Meetup here in Dallas, TX! Join the team on Saturday, April 13th, 2019 for sweet treats With BGWP at Kookie Haven from 11AM – 1:00pm! Wanderlust 108—The World’s Only Mindful Triathlon—brings the community together for a 5K run/walk, dj-powered yoga session, and guided meditation in your local park. Following the triathlon, you can choose your own mindful adventure by enjoying bonus activities, perusing our Kula Market of local artisans, and stopping by Wanderlust’s True North Cafe for a healthy snack or lunch. From dancing with DJs at the main stage to trying something new like hooping and acroyoga, there’s plenty to do when you’re not on your mat. Nationally recognized teachers and musical talent are featured at each event to make for a fun-filled field day for mind and body. Our most valuable resource is not money, it’s people. We have the opportunity to connect with a unique group who understands the position and mindset of the world we live and work every day. Casual social hour/meet & greet. Dallas millennials, entrepreneurs, professionals, and artists, are welcome. Meet-up with other millennials in Dallas networking, connecting, personal development and support. Neighborhood Goods is a new type of department store, featuring an ever-changing landscape of the world’s most exciting brands, products, and concepts. Including Draper James (Hello Reese Witherspoon! ), Stadium Goods, and S by Serena Williams. Brand new to the locally acclaimed Legacy West- Plano, Neighborhood Goods has already made a huge splash with its launch which featured speaker panels by Serena Williams and Ashley Graham. Backed by some of the most prominent investors in the industry for its commitment to being an innovative space that welcomes social interaction and community; Neighborhood Goods has partnered with Bold Babes Co to host the ultimate happy hour for the most ambitious young women in the Dallas/Fort Worth metroplex. A global collaboration platform that was founded in Dallas, TX; the Bold Babes movement was crafted by a collective of young women who yearned to find a community of like-minded goal getters to connect, invest and grow with. The Bold Babes brand and community was born in July of 2018 and since has been featured in local press including, The Dallas Observer for its dedication to the advancement of young women in career and business. Join Stella & Dot’s Chief Inspiration Officer, Danielle Redner, for a light lunch and message of gratitude and empowerment with Dress for Success Dallas, an organization dedicated to lifting women up through economic independence and a network of personal and professional support. Bring in your gently used clothing or accessories to donate in store! All items will be donated to Dress for Success Dallas, a charity organization that helps women get back on their feet. Join O's Kitchen for our OFFICIAL LAUNCH event Saturday, April 6th as we take you on a night in the Islands. Dinner is afro-carribean themed with decor by So Chic Events. Grab your favorite person and come out for a night of good vibes and good food. The Pretty Martini will be serving rum cocktails all evening long. Restaurant style service and seating all for one low price. We can't wait to see you! OASIS Plant store is partnering with Cuates Food Truck, Oak Cliff Brewery, Tribal All Day Cafe, and A Little Party Co for their opening party. There wwill have fresh cut florals to purchase by Sweet Water Botanicals and Henna by Charms of Henna as well. Don't miss out on a big plant giveaway as their way of saying thank you to their customers. Banh Mi Station is a new Asian Fusion restaurant specializing in delectable banh mi and bao sandwiches with tantalizing French and Vietnamese spices reminiscent of Vietnmese street food. We also have many vegan offerings as well! We opened just last month in the Sylvan 30 community of Oak Cliff and hoping to spread the word about our recent opening to our community, commuters and Dallasites. Join us for chats around the table about all things business and being a woman. We want to open up the conversation about being a business woman, entrepreneur, and professional and collaborate together a drop the act! Rent My Wardrobe is launching a brand new app in Dallas, TX and wants to celebrate with you! Together with Kameron Westcott, join us to mix and mingle with your favorite Dallas Housewives and fashion influencers during this startup week fashion track party! Welcome to Dallas's Premier Food Fest showcasing local restaurants, local eateries, local cafe's and local food trucks! This festival is all things surrounding Food so please come hungry!! Our festival will stretch over 8 Hours with over 60 different participating food vendors. Outside of food there will be plenty of fun including Live Music from some of Dallas's best bands! Come celebrate the 5th anniversary of Dallas Startup Week! The Official Launch Party will be held at CF + The DEC Network and will feature Startup Alley, a showcase of Dallas startups. Dallas Startup Week 2019, powered by Capital One, is a FREE, 5-day event, from April 1-5, that impacts and mobilizes 10,000 North Texas entrepreneurs and change-makers. The event will include over 150 sessions across 16 tracks, the launch of the Women of Innovation Summit, a new Corporate Startup Innovation Summit, a series of headline speakers and the annual State of Entrepreneurship. Introducing Art Overdose an event filled with Art, Hip Hop, Poetry, Fashion and More! The Dopest Art Show to Hit DALLAS!! 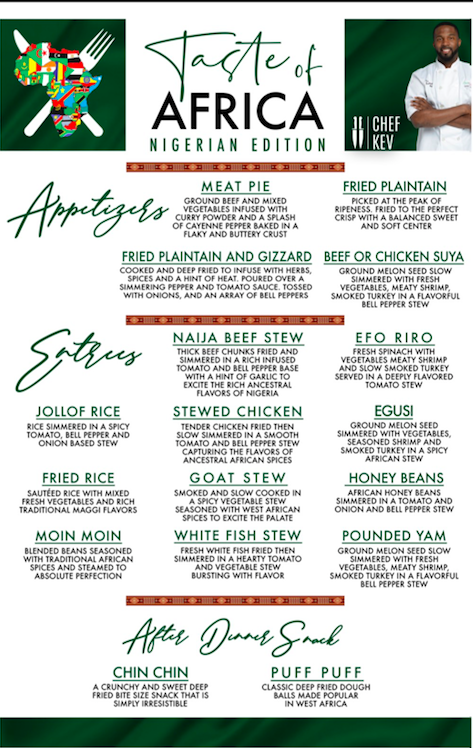 Explore Nigerian cuisine, tasting the unique flavors of multiple African dishes while enjoying a beverage at our cash bar. Kick off Arts Month on the ARTISAN Terrace! Join us on March 30 for an evening of live music, delicious tapas, handcrafted cocktails and incredible views benefiting the Dallas Arts District! 25% of all proceeds from this event will be donated to the Dallas Arts District.